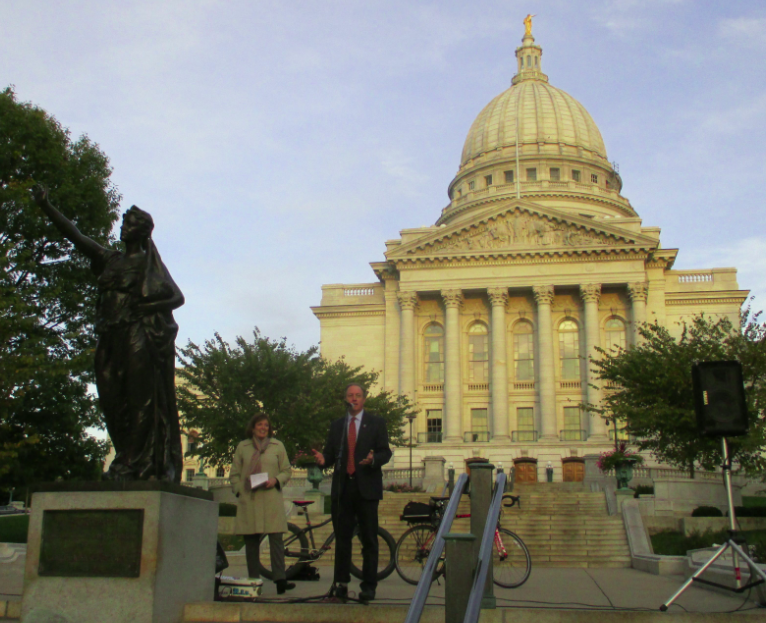 Last Friday, I attended the Wisconsin Bike Summit in Madison. 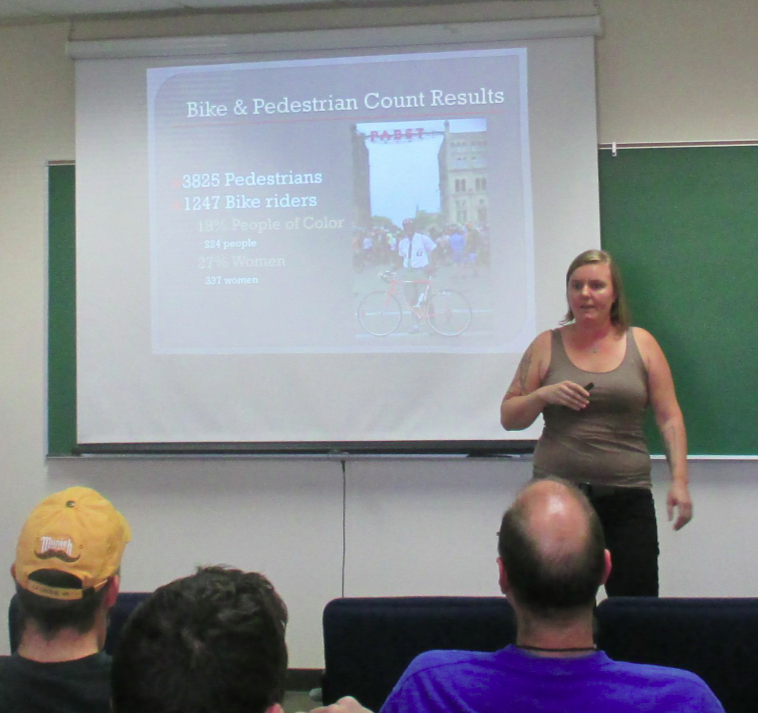 This full-day event, which is organized annually by the Wisconsin Bike Fed, offers numerous presentations from people working to make bicycling better all over Wisconsin. The Bike Summit is always a great opportunity to gain both education and inspiration. 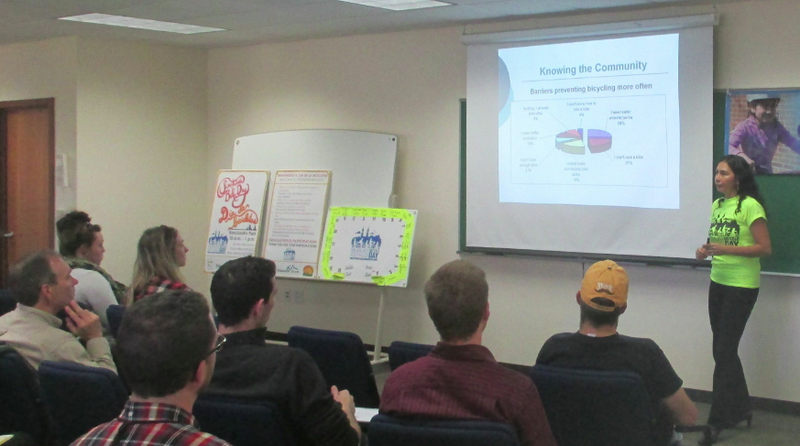 The Bike Summit presentations lasted from 9 AM until 5 PM, with three concurrent sessions to choose among during each schedule slot. Afterwards, there was a 3-mile group bike ride to the steps of the state capitol building for a rally in support of better bicycling. The Bike Fed posted a wrap-up about the Bike Summit on their blog. I attended many of the presentations described there, and I certainly concur with their remarks about the many poignant moments throughout the day. With so many concurrent sessions, it was impossible to attend all the presentations. I want to give my impressions about a few sessions I attended that didn’t make it into the Bike Fed wrap-up. A major topic of discussion among bike advocates nationwide is the issue of equity. Data collected throughout the US suggest that advocacy is failing to address the needs of women, low-income people, and communities of color in order to make bicycling a safe, comfortable, and convenient mode of transportation for all. A few of the presentations focused on this topic. Tatiana Maida and Dr David Waters from the Sixteenth St Community Health Center in Milwaukee gave a wonderful presentation about their work encouraging Latino families to bike more frequently. Their motivation is to address health problems, obesity in particular, caused by sedentary lifestyles. To this end, they started the Milwaukee Southside Bicycle Day three years ago. At the 2014 event, they arranged for bike, lock, and helmet giveaways, free bike repairs, bike rides with local law enforcement officers, and entertainment. The event has grown each year, and this year they attracted 600 people to the event. Maida and Waters spoke of their work listening to their Latino clientele at the Health Center and identifying the barriers to bicycling that they heard. This approach is important for advocates to embrace, because barriers to bicycling considered by those with substantial privilege are often not the actual barriers among cultures underrepresented in bicycling. The success of Maida and Waters in attracting large numbers of families to their event shows the importance of creating connections among residents and community organizations to make bicycling accessible to more people. Shea Schachameyer is in charge of the Milwaukee Smart Trips Program, whose purpose is to encourage people to bike, walk, and use transit more frequently in order to reduce CO2 emissions. This program, which is in a pilot stage, focuses on 12,000 households in two low-income and racially-diverse neighborhoods. The Smart Trips Program conducts surveys on attitudes about biking, walking, and transit. It then follows up by providing information tailored to each individual’s preferences. One of the things Schachameyer has discovered is that low-income people and people of color are indeed interested in biking, walking, and taking transit more frequently. Advocates need to better understand the barriers these populations face in their transportation choices. 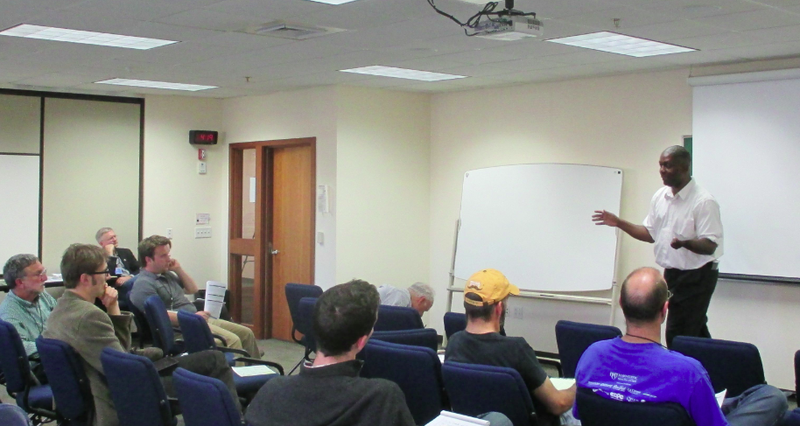 Keith Holt of the Wisconsin Bike Fed spoke about equity, diversity, and inclusion issues as they pertain to bicycling. Holt spoke of his personal experiences growing up in a low-income neighborhood of Chicago. He mentioned his recent experiences at Future Bike, a half-day workshop in Pittsburgh last month that discussed how to involve overlooked stakeholders in bicycle advocacy. He also outlined the success that the Community Cycling Center of Portland, OR, had in working with a low-income, racially-diverse neighborhood by listening to them to learn of their barriers to bicycling and then acting to address those barriers. Holt finished by describing a project by the Adventure Cycling Association to create a 2007-mile bicycle route following the Underground Railroad, a network of secret routes and safe houses used by escaped slaves in the mid-1800’s to reach free states and Canada. One of their challenges was that the ACA is a bicycle non-profit in Missoula, MT, with a membership that is predominantly white, male, and middle-aged. They had few internal resources to bridge the cultural gap to this important chapter in African-American history. To overcome this challenge, the ACA was able to partner with the Center for Minority Health at the University of Pittsburgh. The two organizations proved to be ideal for each other, and their collaboration resulted in the Underground Railroad Bicycle Route from Mobile, AL to Owen Sound, ON, Canada. Holt emphasized that if the ACA, an organization with a severe lack of diversity, can find a way to reach across racial barriers to create a bicycle route with deep cultural meaning to African-Americans, then other bicycle advocacy organizations can do the same. I was particularly impressed and motivated by the three presentations I outline here. Their efforts are critically important and offer lessons to anyone striving to make bicycling better in their own community. One last item I want to mention about the Bike Summit is that I gave a presentation at one of the sessions to tell attendees about Poky Pedaling Stevens Point. The Bike Fed invited me to speak because they became aware of the success I have had in attracting women and men in equal numbers and of all ages – children, young adults, families, empty nesters, and elderly – to Poky Pedals. Most bicycle organizations struggle to achieve anything close to such gender and age diversity, which is why the Bike Fed took notice of PPSP. My main message was that if one caters to all skill levels, focuses on community building and fun (and not speed and distance), and maintains a “Poky and Proud” attitude, then such diversity among participants just happens. I hope some of the Bike Summit attendees take my message to heart and try something similar in their communities. The Wisconsin Bike Summit had a great turnout. Poky Pedalers might consider being part of the crowd at next year’s event. There is far more that took place Friday than what I discussed above or than what was written up in the Bike Fed’s blog post. The Bike Summit is an incredibly stimulating event. It is inspiring to hear so many passionate people talk about what they are doing to make bicycling better throughout our state. If it sounds interesting to Poky Pedalers, I encourage you to consider attending next year. Whether or not you have interest in being an advocate for bicycling, the Bike Summit is simply a great learning opportunity. We are fortunate to have an organization in Wisconsin such as the Bike Fed to make the enormous effort in putting this great event together. I applaud the work of all their staff to successfully create another outstanding Bike Summit. This entry was posted in Advocacy, All Posts, Education, Wisconsin. Bookmark the permalink.